I like to arrange tabletop vignettes with this and that that I can find around the apartment. Of course Ivy knows the instant something is different in here. And she inspects, and sometimes rearranges in her own unique cat design way. In other words she pounces and plays. For this vignette I did a bit of layering. 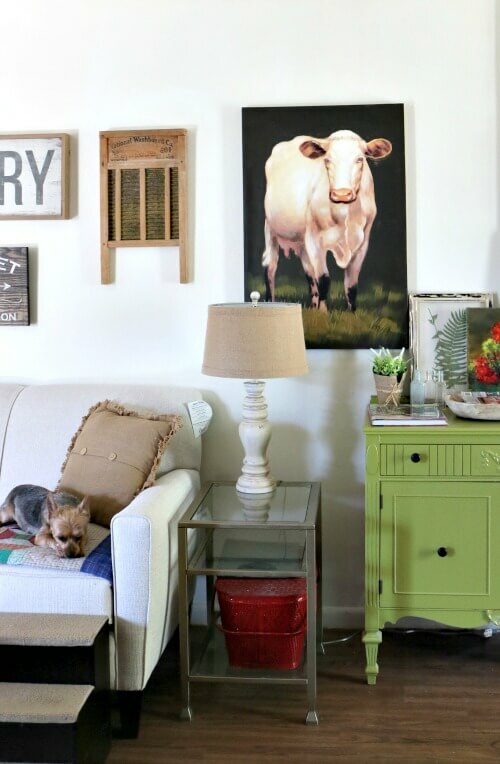 Choose three different sized pieces of wall decor and layer them in the back. Then fill in the space around them, always leaving some space open. I used faux plants, my favorite gardening book, and my dough bowl of decorating/gardening magazines. You want your vignette to work with its surroundings. In this case, my cow painting and lamp. I’ve brought in the red geranium canvas. It picks up on the bits of red around the living and dining space. I added just three of what I call “littles.” In other words the small vintage bottles you see. You don’t want a bunch of littles. Then it just looks cluttered and unfocused. The piece of furniture the vignette is built on adds a bit of visual interest due to the detail of the sideboard. And the black knobs add a bit of elegance. I like to use black in most all my vignettes and when decorating rooms in general. It just seems to ground the space. Here is a bit of the couch with Charlie Ross on the quilt I laid out for them. Ivy naps here most every afternoon, sprawled out on her back. This is where the gang hangs out during the daytime. I’m enjoying my comfy chair and gazing out at the few flowers I have so far. Over the weekend I also rearranged and added lots of color to this blog. It just seemed like a good springtime change. Happy vignette arranging or flower planting, whichever is on your agenda. Looks great. The new couch is very nice. Sounds like you are enjoying your puffy chair. Love your vignette with the pop of red in the picture. I love also how you mixed in the vintage too. Ha ha Ivy wants to be a little designer too and re arrange the decor. She is the cutest little design assistant. 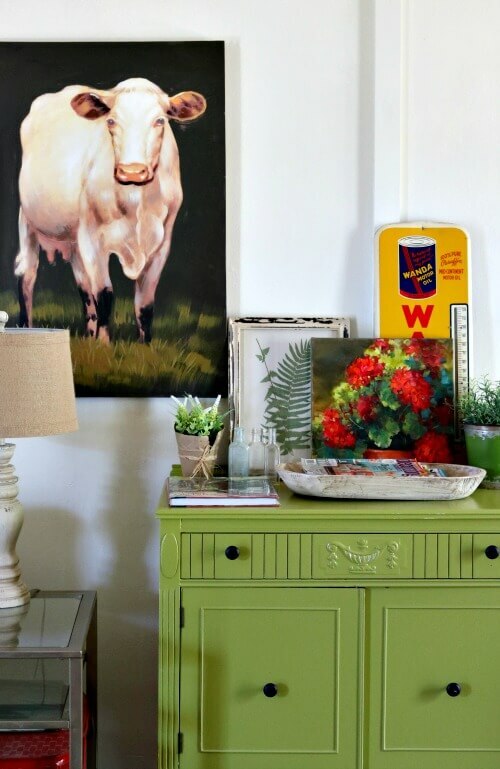 Like the way the red and green painting picks up the green in the piece of furniture. And the red really pops. So cute. Hope you have a nice day. Supposed to be windy here for a few days. But nice. I love what you do in your apartment Brenda. You should have been a real estate stager. You have should an eye for what should go where. I do hope you are feeling some relief from pain now. I am just back from the fracture clinic as I slipped on the ice about 7 weeks ago, I did go with a bang but all is good, my wrist has healed well and I just have to do some exercises to complete my treatment. Love seeing pictures of Charlie and Ivy. Brenda, I love the vignette! All the pieces work perfectly together and blend well with your wall art. The varying heights draw your eye around as well! 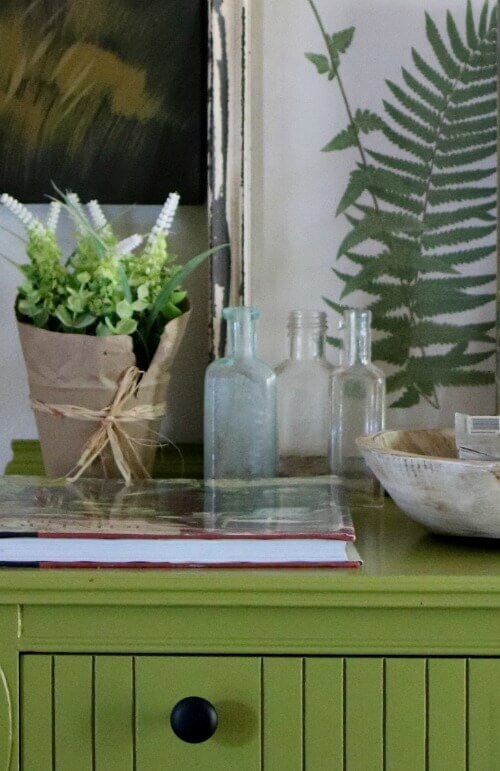 The pressed fern is so pretty…I am loving those because they are so versatile in home decor and are a perfect neutral! So pretty and that sofa was a great find…looks beautiful! Love and hugs! I love vignettes and I especially love the ones that you put together. I seem to have trouble pulling them together. If you have pictures of past vignettes, I would love to see them. I’m wondering how long it will be before miss Ivy rearranges everything on that table!! Didn’t take her long to start knocking things to the floor. This looks really great Brenda. You certainly are good at this. Yes, you would have made a great stager. Everything is just beautiful. I so love that painting. Ivy and Charlie are spoiled to the max. My friend, a prominent designer here for years, says you should always have some black in a room as the eye needs a place to rest. You’re right on. I may overuse. Love your design ideas. I am not very good at vignettes. I have 2 smaller round tables in my living room and I can’t figure them out! Your apartment is so inviting! You have a great talent for creating beautiful vignettes. 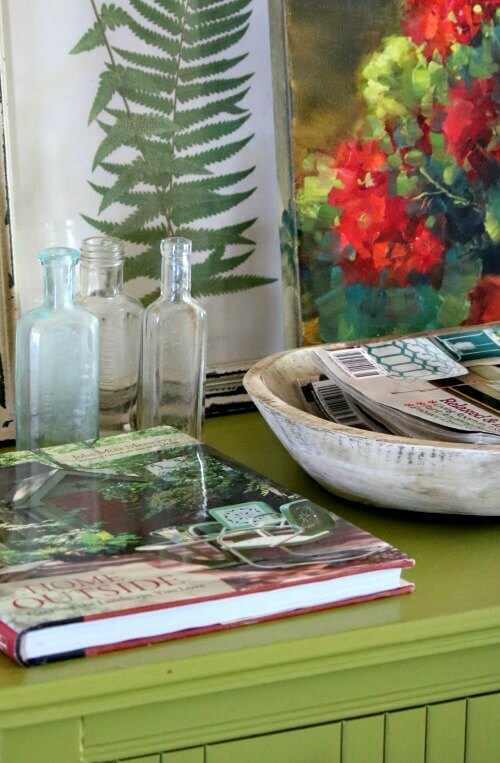 I love the pops of red in this vignette, especially with the lime green. How are you keeping Ivy from using your new couch as a scratching post? Ivy doesn’t scratch anything but her scratching posts. I just bought a dough bowl and am excited to see an idea for it. Thank you! Your vignette looks great. On another subject, have you reviewed any books by Kristin Hannah? I just read one by her and have mixed feelings and I’m looking for another opinion . I love reading Kristin Hannah books. Isn’t she the one who wrote the fiction story about the Holocaust? I cannot remember the name but I loved that story. What did you read? I don’t think I’ve read her books. Love the look. 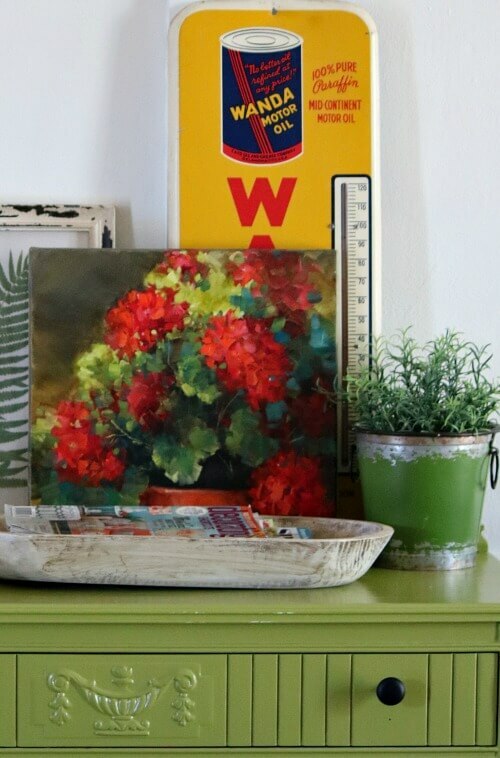 That geranium in the painting looks so real — the artist did an excellent job. Charlie looks so peaceful on the quilt. Your new couch is really pretty. Brenda, you always inspire me to try a new idea and not to be afraid to reinvent what I already have! I do enjoy all the pictures of your cozy space. 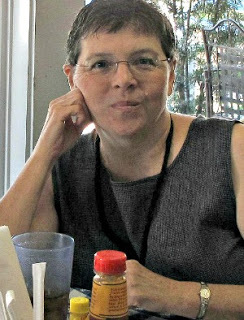 To Judy – whenever I am on the fence about a book I’m reading, I check out the reviews on the “Goodreads” site. “Happy Spring” says your apartment. Your Baby are very blessed to have such a wonderful comfortable home and Mom. I love the piece of red under your green table..not sure what it is..possibly some storage..but your colors sure “pop”. I agree you have an eye for decor staging..but also, for living a nice life. Thank you for sharing. I enjoy your posts.. Cheers..
Love the tabletop vignette. These are things I would not think of. So glad you post this blog with so many decorating and gardening ideas. Charlie and Ivy are so adorable, I love reading about them. Your vignettes are always beautiful. So much inspiration. Thank you.